The Mini Goldendoodle is a smaller version of the ACHC recognized Goldendoodle. It is a mixed dog breed that is a cross between a Miniature Poodle and a Golden Retriever. This breed has seen an increase in popularity recently as people love the hypoallergenic properties any breed mixed with a poodle can possess. A Miniature Goldendoodle puppy can vary in size based on the generation of the dog. For instance, an F1 or 1st generation cross would be 50% Miniature Poodle and 50% Golden Retriever. The result is generally a dog that will be in the range of 30-40 pounds. When a Mini Goldendoodle is crossed with a Mini Poodle, the result is an F1-B or 2nd generation. This hybrid dog breed will be smaller in size and will be more likely to possess hypo-allergenic properties based on the fact it is 75% poodle. Although this breed is becoming very popular, it is not currently recognized by the AKC or ACA as a purebred dog. Early socialization is important to any dog breed. The Golden Retriever is known for being a friendly, happy-go-lucky dog breed. The Miniature Poodle is another friendly dog breed. With the Miniature Goldendoodle, you get a mix of both. Mini Goldendoodles are often intelligent, cheerful, and friendly. This mixed dog breed generally makes an excellent family pet and is good with children. Plus, due to their low prey drive, they tend to get along with other dogs and companion animals. Though unlikely to intimidate anyone due to its fluffy coat and smaller size, this dog breed can be an alert watchdog. However, they do not tend to be noisy. Because they may bark infrequently, it’s best not to rely on them as a watchdog or dog for protection. These pups are highly adaptable. Because of their smaller size, they can be a great fit for apartment living or a bigger home with room to run. They tend to do well in just about any climate. However, like any dog, they are sensitive to extreme heat. Due to their smaller size, you may need to gear up with some dog-friendly winter gear when temperatures start falling. This dog breed is loyal and people-oriented. They love to be in your company, which means they aren’t happy being left alone for long periods. Make sure your new puppy has an active role in your life. If you need to leave him alone for a bit, be sure to leave some comforting toys or challenging puzzles behind to keep him occupied. 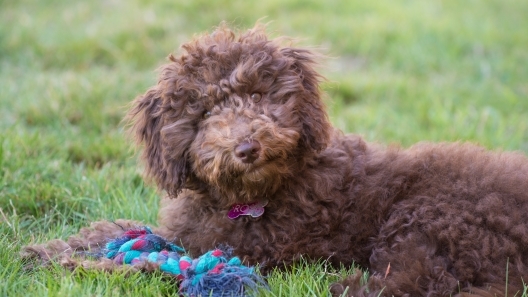 The breeds in the Miniature Goldendoodle cross are generally healthy. On the Golden Retriever side, hip and elbow dysplasia, as well as canine cataracts, can be a concern. On the Miniature Poodle size, patellar luxation and progressive retinal atrophy can be a concern. 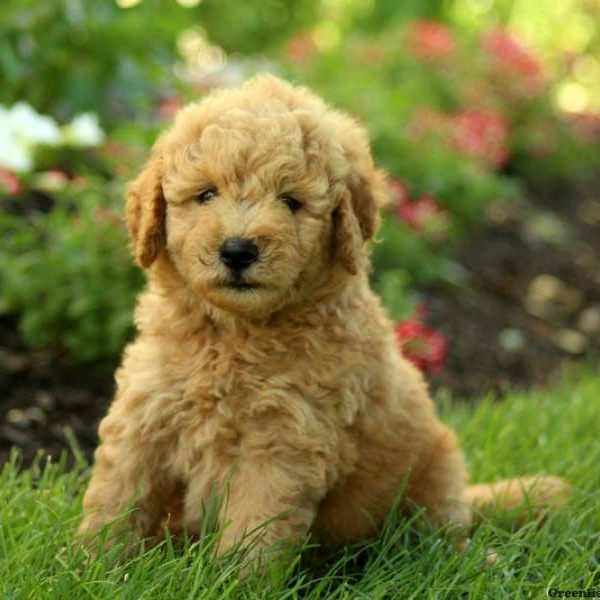 The Mini Goldendoodle is a hybrid dog breed that may or may not be prone to genetic diseases common in the cross-breeds depending on the genetic history of the parents. Purchasing from a responsible and reputable breeder often helps to avoid many of these medical issues. A good way to determine any potential health concerns is to check with the breeder to find out the history of the parents. Both the Golden Retriever and Mini Poodle are highly trainable dog breeds. This hybrid dog breed will be the same in most cases. They tend to be sensitive to the tone of voice and are eager to please. Though they are a good fit for novice owners, it may still be a good idea to have a few sessions with a potential trainer to ensure both you and your new puppy are comfortable. This dog breed requires a moderate amount of grooming. With the Mini Poodle in the mix, this mixed breed has a low shedding factor. It often has a curly or corded coat and is fairly hypoallergenic. If your Mini Goldendoodle is more Golden Retriever than Poodle, it may have longer fur with minimal amounts of shedding. You’ll still want to brush their coat and trim their nails regularly. Handling your puppy’s paws regularly early on will help get them comfortable with grooming. It’s also important to brush your dog’s teeth regularly to avoid the buildup of tartar and future dental issues. Given the mix in this specific breed of puppy, the Miniature Goldendoodle should have a moderate energy level. 20 – 30 minutes of exercise a couple of times a day will go a long way with this puppy. They are also likely to match their energy level to yours, so be prepared for some bursts of energy as well as plenty of cuddling on the couch. In general, a well-exercised dog is a happy dog, so be sure to let your dog run to unwind. Regular walks and playtime will keep this pup active and healthy. If you find they still have some extra energy from time-to-time, you can also throw in a trip or two to the dog park. Due to the retriever in their bloodlines, your Mini Goldendoodle might even love to swim! These dogs tend to be 13-20 inches in height. For an F1 or 1st generation cross, a Miniature Goldendoodle will usually fall in the 30-40 pound range. An F1-B or 2nd generation cross often results in a slightly smaller dog in the 15-30 pound range. Looking at the size of the parents for an F1 or F1-B puppy is a good indication of what size to expect in a Miniature Goldendoodle. A Mini Goldendoodle generally lives 10-14 years. Miniature Goldendoodles are also sometimes referred to as Miniature Groodles or Mini Groodles. Mini Goldendoodles are a friendly, cheerful, and intelligent dog breed with hypoallergenic properties that also make a good fit for families. 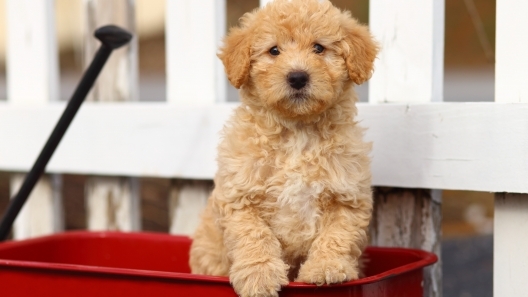 Here are five things to know about Mini Goldendoodle puppies. Welcome to Greenfield Puppies' Miniature Goldendoodle page! We take pride in bringing you a great experience when finding your new family member. 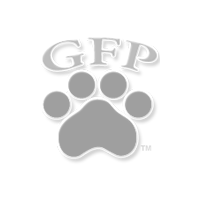 Finding the perfect puppy for your family is of great importance, and we are here to support you. If you have any questions, please contact us. Otherwise, contact one of our reputable breeders to meet a Miniature Goldendoodle puppy today!